20 Things you need to know about the SGR Project – Mohammed Hersi . A hotelier who is passionate about Tourism & Governance in Africa. It is my pleasure to welcome you to my blog. 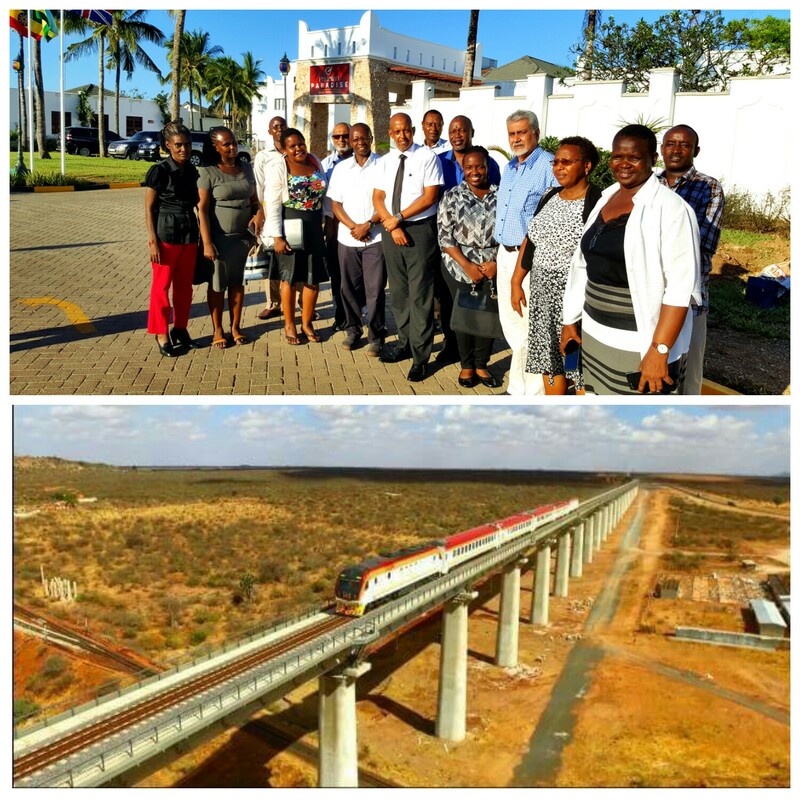 This week as Kenya Coast Tourism Association board we met MD Kenya Railways Athanas Maina who gave a brief on Standard Gauge Railway . He spoke for 90 minutes without any notes. We also had a very useful open Q&A. Allow me to share some of the issues . I have managed to put together several points that I managed to pick from our discussion. I will refer to them as the 20 things you need to know about the SGR. 1. While the distance length between Mombasa and Nairobi is 472kms the total track laid is 616kms to serve Station areas, workshops and marshalling yards with many passing stations. We equally do not have a single level crossing like what we had on the old line . Ethiopia’s has many level crossing lines. Level crossing is the cross sign where vehicles are stopped to allow the train to pass. The line is all suspended high up in populated areas hence the perceived high cost. 2. We discussed the issue of schedules and tariffs. Both will soon be availed . As tourism players we shall play an active role to determine the schedules so that it fits with Jomo Kenyatta International Airport arrival schedules to allow connection to Mombasa . It will also be a game changer for domestic tourism. 3. At any one time they can move 1620 passengers. Initially they only had an economy & first class. After we made a suggestion two months ago they have now ordered two coaches with flat beds similar to an aircraft. We are honoured that our views count. 4. The stations are all themed borrowing heavily from the local surroundings. All the stations will be handed over to the community and it is the policy of Kenya Railways that they employ as many people from the local areas where the stations are located. Please watch out for the ads . Over 300 people are already being trained in China. 6. Passengers train will all be air conditioned and WiFi enabled. This is cool . I have said it again and again , riding across Tsavo national park is taking a game drive on a train ticket. This is special. 9. Our SGR has close to 40KM of raised super bridges some as high as 40 Metres like in Tsavo to mitigate against accidents and wild animals underpass. In Nairobi National Park the super bridge is anything between 8 to 41 metres. 11. Naivasha inland container depot is NOT meant to undermine Mombasa. We have always had Nairobi as a ICD . Naivasha is designated as a Export processing zone. Key hitch for Kenya to attract manufacturers is the cost of power. With next door Geothermal plant , electricity will be very cheap close to free which will be used to attract investors. 12. The line will also extend to Kisumu then Malaba , Uganda will then connect from there. It is the dream and goals of EasternAfrica to be connected via train network. 13. Passengers train is an icing on the cake since the main goal is to move cargo saving our roads from damage and accidents. The old line passenger line will cease while RVR will continue to haul cargo and whoever wants to use then is free to do so. 17. Why China? The Exim bank were the only guys ready to finance the project . The rest is just noise. If anyone is ready to finance Naivasha to Malaba please let me know I link you up with Eng Maina. Fact is that others is just talk but no action to indeed finance the line . Chinese are financing very many projects around the world so we are NOT the only ones. 20. A fam trip will be arranged to Nairobi and return same day. KCTA will liase with KR. Express train will do 4 1/2 hours Nbi Mombasa. Next PostJunior Stars Kenya & Watoto Soccer Awards Mombasa is seeking for support !!! This one of the best thing for years to hit East Africa. Great informative article. Keep doing this Mohammed. Who is John Holland of Australia who will be operating the line aka no 5. And arent you being conservative with the truth? I will highlight two areas where you are deliberately misinforming your audience or you are plain ignorant of the facts at play. Point 12…Uganda will pick it from there…where is the agreement with Uganda that they will extend the line from Malaba to wherever? Documents available show that the SGR while initially touted as an EA project has remained a Kenyan project due to allegations of overpricing and corruption that inflated the initial costs from 320 billion to the current costs that is almost 450B to Nairobi alone..I guess our neighbours saw the kula nyama appetite of the Jubilee powerbrokers and didnt want any part of it. Secondly and most importantly the SGR without our neighbours in EA doesnt make economic sense period! Point no 17 is also a bag of lies the only reason China agreed to finance the SGR is because they dont mind if the cost is inflated to fill the pockets of Uhuruto. Other countries with the capacity to finance the SGR would have asked questions on the pricing and other due processess that China being a country led by a dictator do not bother to ask as long as the money lent is repaid so your assertion on China I think also reflects your integrity as a person. And who are these you allude to making noise but no action? You must be very ignorant of the governance process in our country or maybe a sycophant of Jubilee hired to sing their praises. Back to my point..Only the GOK led by Uhuru is allowed by law to take a loan of the magnitude of financing the SGR from external and internal sources of financing..No one else. I dare you to show me where in the constitution or the Public Procurement Act where anyone can just go and commit the country to a loan for big infrastructure projects since you claim others whom you do not name are all talk and no action. Read your constitution and understand it well before penning your ignorance for all to see. Michael thanks for reading my piece . We do not necessarily have to agree. Who is John Holland ? A Simple search would have helped you . Well it is within your right to give your opinion but terming my piece as ignorant or I am a sycophant is simply out of order. Please note I am not short of letters and words if I chose to call you name as well buy I won’t stoop low. I chose not to delve into cost aspect for obvious reasons since both sides have chosen to dig in and more importantly it is not within my control. If you think you can do something about the cost please by all means go ahead. I hope you realise that you can still communicate your point without being condescending and patronizing. State your points besides you are at liberty to write your own piece and blog it buy I will not tolerate any act of bullying or try to shove your thoughts down my throat . Argue your case and DONT get personal.